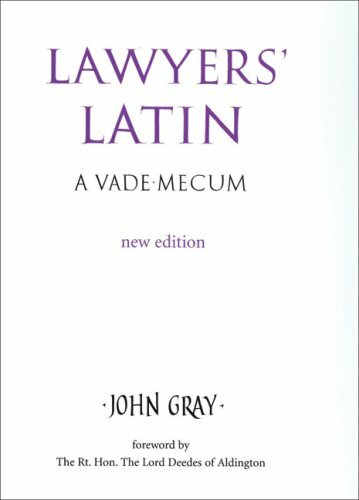 Updated and expanded, this invaluable reference book was originally written as an aid for those disadvantaged by the deteriorating standing of Latin in our education system and by its use as legal terminology. Professional and comprehensive, yet lighthearted, it is immensely readable and has assumed a readership far beyond the lawyers for whom it was primarily designed to assist. All those interested in or curious about Latin may like to dip in to discover such particularly succinct phrases as uberrimae fidei (of the utmost [good] faith), in tenebris (in the dark), doli capax (capable, legally, of wrong or fraud) or mala fide (in bad faith). Few learn Latin in school and young lawyers with minimal knowledge of the language will experience considerable difficulty as they continue to meet it, particularly in old reported cases, academic articles, statutes and in decisions of EC institutions and even falling from the lips of renegade judges. When Latin brings progress and comprehension to a halt, what then? Reach for "Lawyers' Latin".